A superb instructional DVD for five-string banjo dealing with the 5th through the 22nd fret. Included are sections on roll patterns, chords, songs, licks, chord progressions, arranging songs, improvising, melodic style, chromatic style, chromatic style, back-up, and much more! Companion book also available. 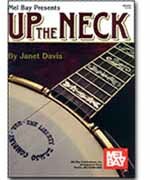 A visual method for learning the basic techniques used to play bluegrass banjo accompaniment in up the neck positions. The material is presented in a step by step approach appropriate for all levels of pickers, and a tab booklet is included. A step-by-step demonstration of the basic techniques and patterns used to play roll style bluegrass banjo backup in the open, or first position. Contains material of interest to both beginners and more experienced players alike. Bill Evans demonstrates effective banjo backup for 7 standard tunes, showing the techniques in detail, and also playing them with a band. A variety of keys, styles and tempos are demonstrated in this 2 hour DVD with examples of roll based backup, vamping and two finger techniques. Both up and down the neck backup are shown and a tab booklet is included.